We produce from the small series of a few pieces to the big series, on all the activities carried out. The company Fratelli Pavan has specialized in mechanical processing, in the production of turned small metal parts and hot stamping. Production of parts of different type of material; construction steel, carbon steel, stainless automatic, stainless steel, brass, bronze, aluminum, plastic, etc. ..
Mass production of parts to be turning, with diameters from 3mm to 60mm, including through the use of lathes and hydraulic cam, equipped with bar loader (for simple parts at competitive prices). Working on carbon steel, stainless steel, brass, bronze, aluminum, plastics, etc. Production of molded under heat, press Rocker with max power 400 Ton. 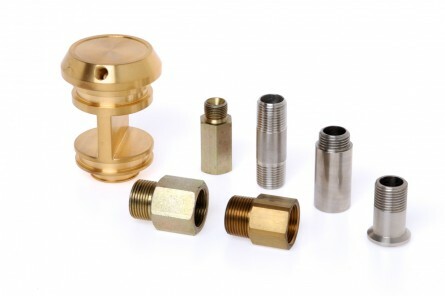 Stamping mainly of: fittings for gas, plugs, valves, supports for heaters, valves, parts for appliances, hydraulic hoses etc. Chance to work, and not from bar, materials such as Teflon, PVC, acetal (pom), polyethylene, polypropylene, nylon, eplexygas, etc. 360 ° production from small series of a few pieces, to large ones on all the activities carried out.